Mon, July 19, 2010: UPDATED with 28 more songs! Vacation time and annoying little details like money didn’t quite work out, so I wish all my friends and readers who are going a GREAT time … and I don’t want to hear a single thing about it, or it’ll drive me crazy. Internet blackout for me! No Twitter! What I will do is find a great bar (which will, I hope, have left a few bartenders behind that aren’t going to Tales) and quaff some cocktails. 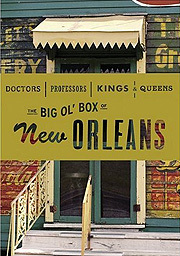 So, you can buy the whole list, or pick a handful that you might want to hear, or if you have an extensive NOLA music collection use the list and drag the songs into a new playlist on iTunes, whichever you like. 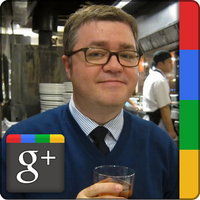 (Alternately, you can just ignore it and make your own!) One annoying hitch — I made a 100-song playlist, and for some reason iTunes truncated it to 72 the first time I tried to upload it, so I’ve had to break it up into two playlists. There should be widgets below to take you to iTunes, but in case it doesn’t render properly here are the direct links: (Part 1, Part 2) Look for the full printed list after the break. 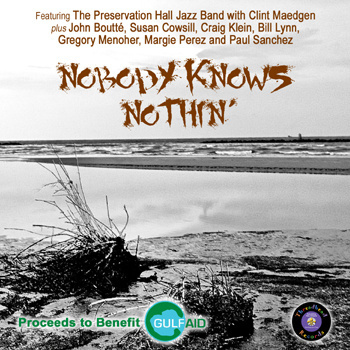 Threadhead Records have released a new single entitled “Nobody Knows Nothin’,” performed by the Preservation Hall Jazz Band with Clint Maedgen, along with John Boutté, Susan Cowsill, Craig Klein, Bill Lynn, Gregory Menoher, Margie Perez and Paul Sanchez, and written by John Boutté, Bill Lynn and Paul Sanchez. Proceeds will benefit Gulf Aid, a 501(c3) nonprofit corporation established in response to the biggest oil spill in US history just 50 miles off of the Louisiana coast, and are distributed to organizations focused on supporting wetlands/coastal environmental issues & the well-being of fishermen, and the regional seafood industry. To purchase the digital download of the song, and to help with the oil cleanup efforts, go to threadheadrecords.bandcamp.com. The song will also be available soon on iTunes.